Goa which was under the Portuguese rule for nearly 450 years, embraced many traditions and cuisines. 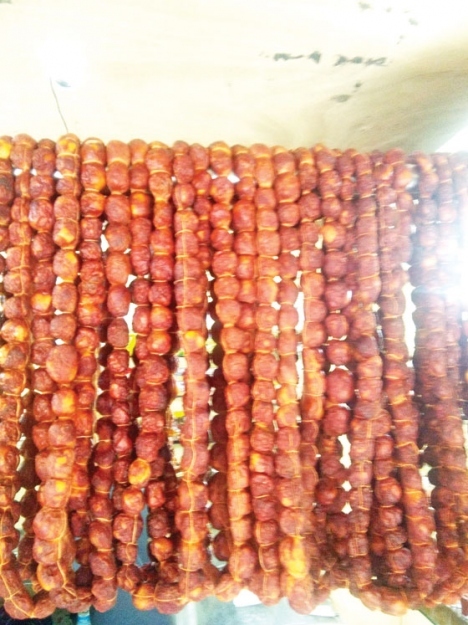 Choris, the Goan pork sausage happens to be one, along with Dodol and Bebinca. Choris is made from pork marinated in a mixture of vinegar, red chilies, and spices which is stuffed into casings. They can be raw (wet), smoked or cured through salting and air-drying. Traditionally, it was made at homes for their own consumption but gradually it took a commercial shape and now it is being produced in factories and many manufacturers have their own secret spices to flavor their product and proudly so. Goans and also the tourists enjoy this with either the local Goan Portuguese-style crusty bread (Pao), or pearl onions, or both. They are also used, cut into chunks, as the meat ingredient in a rice pulao. However, the sale of these sausages is not very encouraging even as the shelf life of such cured product varies from three to eighteen months. Manufacturers do believe that the sale is seasonal and at present when lent period is on, the sale is surely on the lower side. Maganlal also believes that this industry of Choris commercialised in last ten years and there seems to be a lot of awareness of Goan products like Choris, Bebinca, Dodol etc. “The potential for choris is huge and there is a chain of restaurants in Mumbai to which we are supplying who have introduced choris in their menu. In our store, people ask for certain brands of choris and the most selling brand is Costas,” added Maganlal. Costas, one of the largest and oldest manufacturers of choris in Goa was established in 1885, and from exporting of spices and fruits we have diversified into manufacturing of canned products, cold meats and Goan sausages. They make Goa pork sausages with a blend of pork meat, pork fat, spices, coconut vinegar and other spices. “The Goan sausages that are manufactured by us are vacuumed packed and have a shelf life of four months. We also manufacture canned sausages, which have a shelf life of 18 months, the same are ready to eat. This is especially convenient for people travelling abroad and out of Goa, as they can carry a typically Goan product with them, which they can share with their relatives and friends. We are presently selling on an average around 1000 kilograms a month with a growth of 10-15 per cent annually,” said Indra Costa, managing director of Costas. Costa felt that pork meat is not easily available and is always in short supply. “The tax on the manufactured product at the moment is on the higher side at 12 per cent and since this is a food product it would be beneficial to the buyer as well as the seller if the tax structure is revised. The government should promote pig farms and give subsidies for the same so as to encourage and increase the availability of pork meat,” added Costa. Julius Pereira, factory in-charge of Homemade Sausages based in Pilerne said that the production of choris depends on the season and since now it is Lent period the production is a bit low. “We do not export it but a small quantity does go to Mumbai or Bangalore if there is a demand. However, we are not promoting export and we are satisfied with what market we have in Goa. If the government makes us the raw material easily available, the business could grow,” said Pereira. Yansi D’Souza proprietor of Joaos Sausages from Mapusa said that the business is low because of the shortage of raw material coupled with government clamping down on GST etc. “There is a lot of competition and the road has been a rough ride. It is our home business which is running for last 50 years. The production depends on the time of the year and during this lent period we hardly produce 2-3 kilograms per day but during summer it would be around 18-20 kilograms per day. With the pork price shooting up and competition takes away the market share, the business is tough but we just maintain good quality and we only sell our products in Mapusa and Panjim,” said D’Souza.